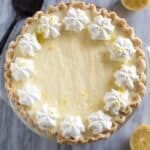 Creamy lemon chiffon pie is an old classic that was always a favorite at holiday parties when I was young. Add 1 1/2 cups water, lemon juice, salt, 1 cup sugar, and butter to a large saucepan. Bring mixture to a boil. While waiting for mixture to boil, stir cornstarch and 1/2 cup of water together in a small bowl. Stir into saucepan and turn heat to low. Cook until thickened. Separate the egg yolks and whites into two separate bowls. Beat the egg yolks with a fork. Add a large spoonful of the hot mixture from the saucepan, to the egg yolks and stir well. Continue slowly adding a few more spoonfuls, stirring after each addition to temper the eggs. Add the tempered egg mixture to the saucepan. Remove from heat and stir in lemon zest. Allow to cool for 10-15 minutes. Beat the egg whites with electric beaters. Slowly add 1/2 cup sugar as you go. Beat until stiff peaks form. Fold egg whites into the mixture in the saucepan. Pour filling into cooled pie shell. Chill in refrigerator for at least 2 hours. I like to place a piece of wax or parchment paper gently over the top of the pie (if you use plastic wrap or tinfoil it will pull some of the topping off when you remove it).